A Mexican drug cartel massacred 72 Central and South American migrants within 100 miles of the U.S. border that they were trying to reach, according to an Ecuadorean survivor who escaped and stumbled wounded to a highway checkpoint where he alerted marines, official said Wednesday. The marines fought the cartel gunmen at a ranch in the northern state of Tamaulipas on Tuesday, a battle that left one marine and three suspects dead. They found the bodies of 58 men and 14 women in a room, some piled on top of each other. The Ecuadorean migrant told investigators that his captors identified themselves as members of the Zetas drug gang, said Vice Adm. Jose Luis Vergara, a spokesman for the Mexican Navy. Authorities believe the migrants were from Honduras, El Salvador, Brazil and Ecuador. 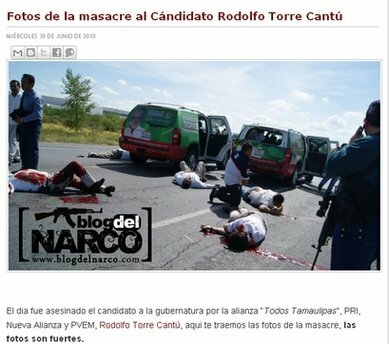 It is the biggest massacre to date in Mexico’s drug war and the most horrifying example yet of the dangers faced by immigrants trying to get to the U.S.
“It’s absolutely terrible and it demands the condemnation of all of our society,” said Alejandro Poire, the government’s security spokesman. Authorities did not say why the gang killed the migrants. Mexico’s drug cartels frequently kidnap migrants and threaten to kill them unless they pay fees for crossing their territory. Sometimes, gangs contact relatives of the migrants in the U.S. and demand they pay a ransom. The bodies were discovered Tuesday when Marines manning a checkpoint were approached by a wounded man who said he had been attacked by gang gunmen at a nearby ranch. Officials said he identified himself an illegal migrant and said that he and other migrants had been kidnapped by an armed group and taken to the ranch in San Fernando, a town about 100 miles (160 kilometers) south of Brownsville, Texas. The scale of the massacre of migrants appeared to be unprecedented even by the gruesome standards of Mexican drug cartels. It was unclear if all 72 were killed at the same time — or why. A federal official, who spoke on condition of anonymity, said investigators believe the victims were killed within recent days. The Navy said it dispatched aircraft to check out the man’s report and when the gunmen saw the marines, they opened fire and tried to flee in a convoy of vehicles. One marine and three of the suspects were killed in the shootout. Navy personnel seized 21 assault rifles, shotguns and rifles, and detained a minor. The youth, who was apparently part of the gang, was handed over to civilian prosecutors. 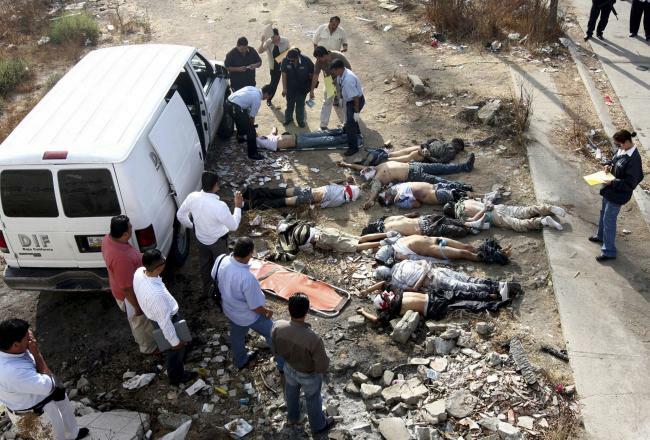 It was the third time this year that Mexican authorities have discovered large masses of corpses. In the other two cases, investigators believe the bodies were dumped at the sites over a long time. in an abandoned mine near Taxco, a colonial-era city south of Mexico City that is popular with tourists. In July, investigators found 51 corpses in two days of digging in a field near a trash dump outside the northern metropolis of Monterrey. Many of those found were believed to have been rival traffickers. But cartels often dispose of the bodies of kidnap victims in such dumping grounds. The region has been besieged by a turf battle between the Zetas and their former ally, the Gulf cartel. Mexico’s drug violence has surged since President Felipe Calderon dispatched soldiers and federal police to root out drug traffickers from their strongholds in northern Mexico and along the Pacific coast.